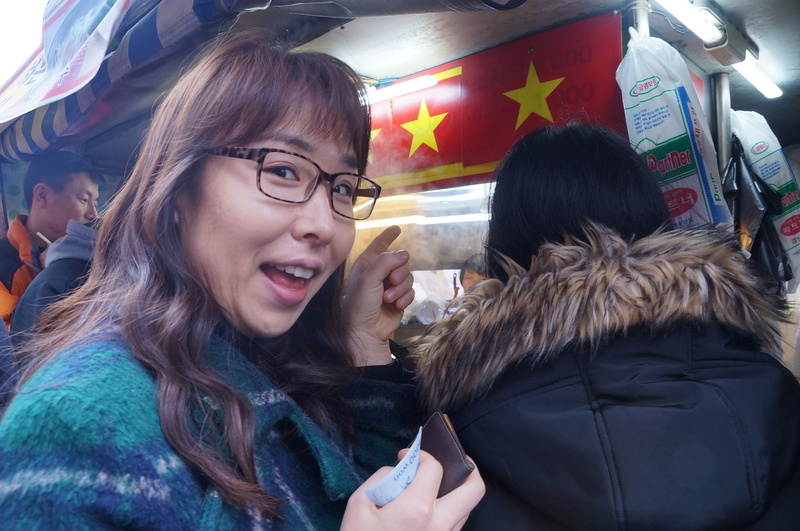 When visitors are looking for street food they usually head to the famous tourist districts such as Meyongdong, Insadong, or Gangnam. Though these places have some delectable goodies, the spot the locals flock to is Noryangjin. Noryangjin is a famous area for adult academies where students are cramming at all hours of the day or night in order to get ahead in Korea’s competitive job market. Many of these students have little free time, so they need to get their meals quickly on the go. Noryangjin offers the perfect solution as the streets are lined with food stalls with meals as cheap as 2,000-5,000 won (2$-5$). 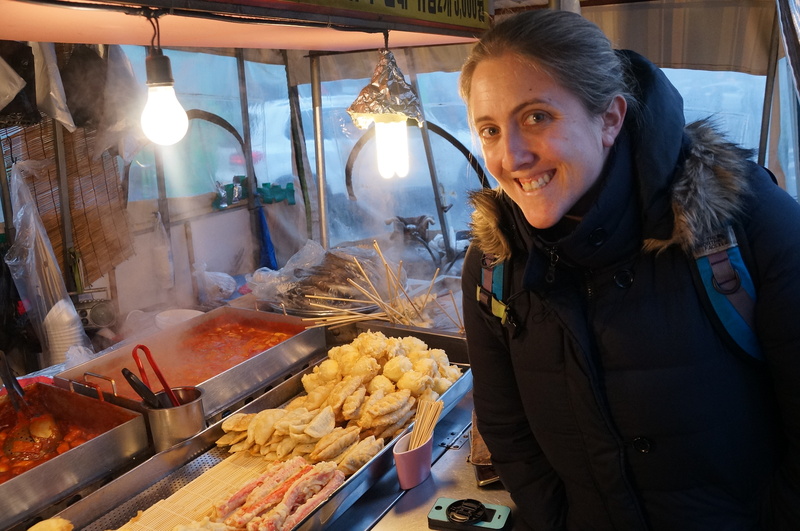 I had only heard that this area was famous for its seafood market, so I had no idea of the delicious treats that lay just on the other side of the street. Though I had visited this area numerous times, I did not discover the street food area, until my trainer changed our PT sessions to a gym in that neighborhood. I would enviously watch the local students slurping up piping hot noodles, as I headed to the gym. Eventually, I could not stand it anymore, so I gave in and started trying the foods as a post-workout treat. Generally, I would just get the chicken skewers, since I was aiming to be on a low carb diet. However, in my last few weeks in Seoul I decided I had to try everything! I started the food journey on my own, trying something different each Saturday, however I began to realize it would be a daunting task to sample everything, as the portion sizes are quite generous. Luckily, my friends Yujin and Ggu were able to help me finish off the remaining dishes in my last few weeks of living in Seoul. I think it’s best to start with the famous “Pancake Hotdog”. 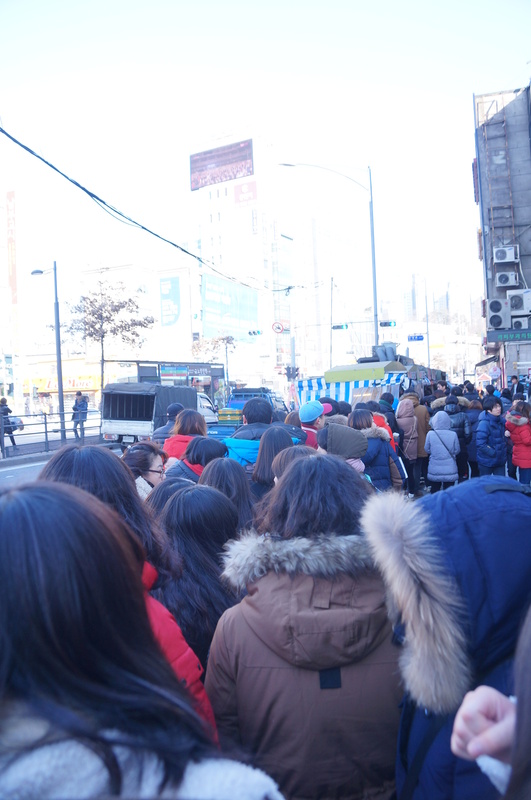 Every single day, people wait in hour long queues for this special sausage. It does not matter the time of day or the weather, this vendor always has the longest line. On a daily basis, the lines are so long that they block the adjacent side street. 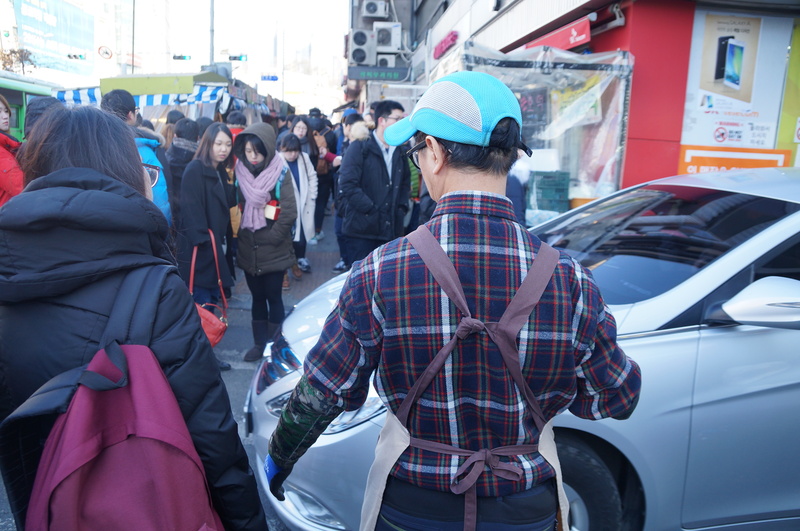 Any time a car decides to push through, a vendor has to come and guide the traffic. 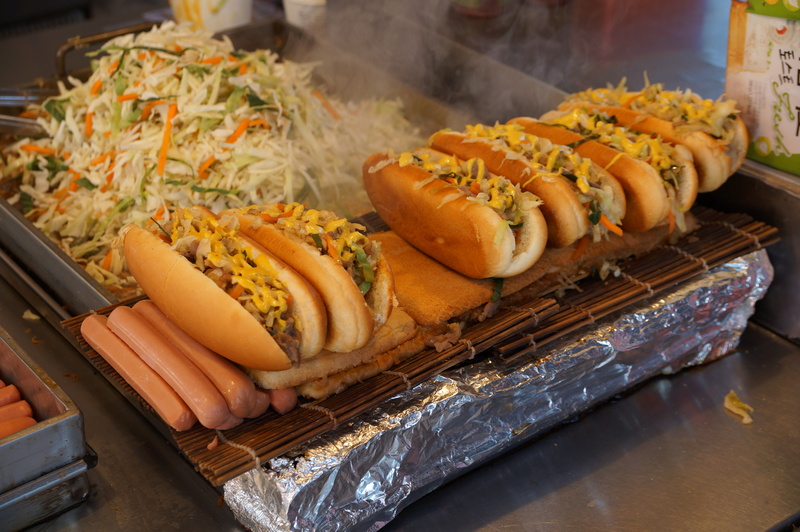 It is an amusing site to see, as the local Koreans will do anything to eat these special hotdogs. 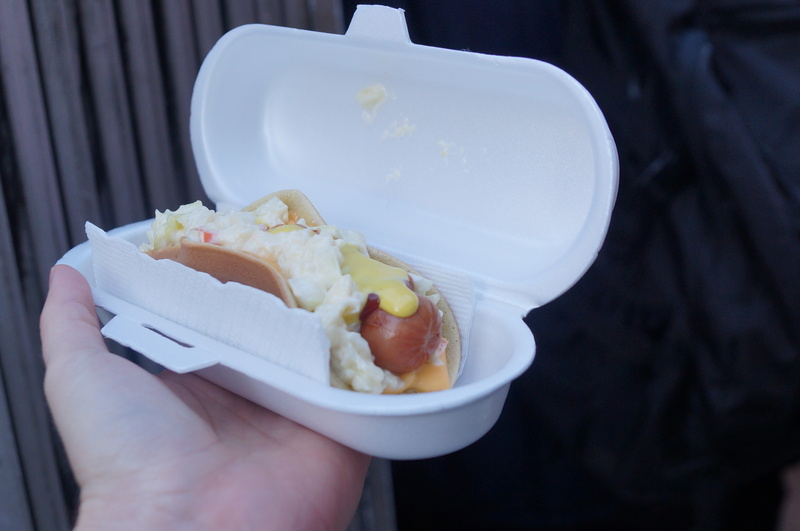 I only had the patience to try this hotdog once, as crowds and lines are not my favorite way to occupy my free time. While waiting in line I chatted with a local couple who told me that Noryangjin is popular for couples as the street food is trendy, but cheap. Noryangjin is one of the many “hotspots” for Korean couples, so don’t be surprised to see an abundance of matching couple-wear, as well as young people canoodling and feeding each other their snacks. Sharing meals together is a staple part of Korean culture, as sharing food is meant to bring people closer together. 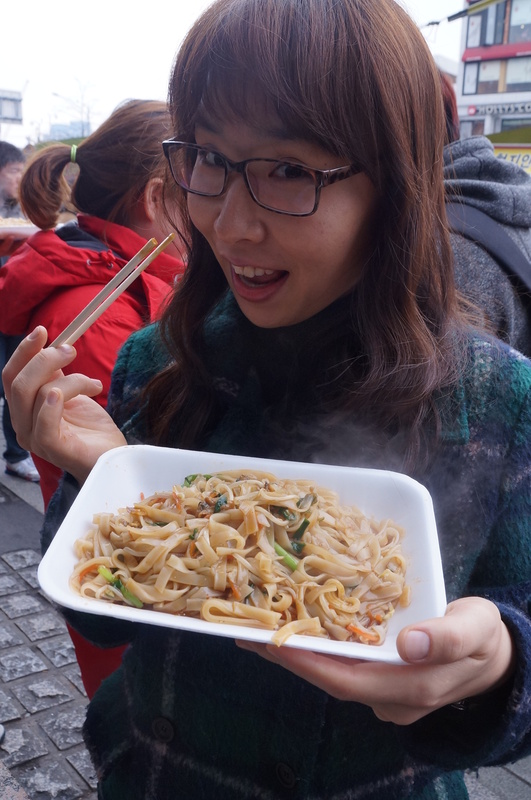 Rarely are people eating alone at the street stalls, and those who do eat alone, generally order their snacks to-go. Once it was finally my turn, I did my best to get some shots of how everything was made. However, I was quickly told to only take photos of the samples, and not the cooking methods. Luckily, I got one quick shot before I was caught. As you can see in the photo above, pancake batter is poured on a searing hot griddle, while the hotdogs cook up at the top of the grill. The batter is cooked until it is almost crispy, then it is folded around the hotdog and covered in toppings. The options are plain, cheese, double cheese, or corn salad. 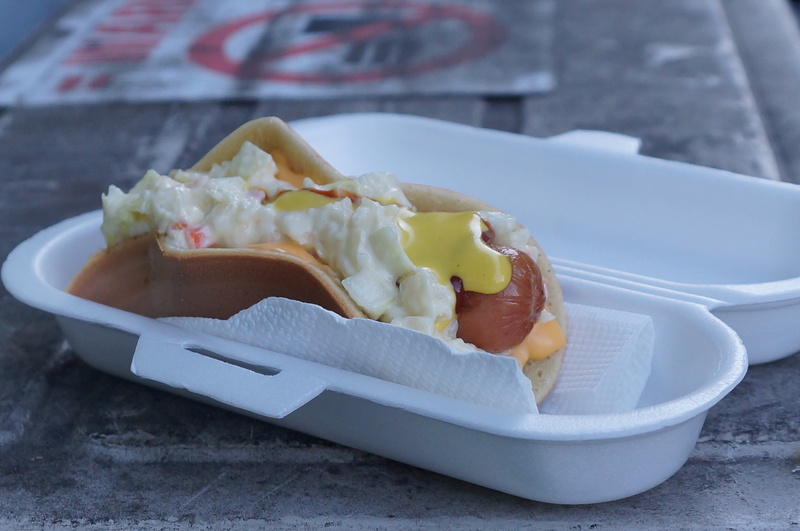 All of the dogs are topped with cole slaw, then placed in a styrofoam container. Patrons can not eat their hotdogs in the tent, because the vendors must keep the line moving. The “pancake dog” was tasty, but by no means was it the best thing I have ever tasted. I feel it could have been improved by having a bratwurst, or more seasoned sausage. The sausage was more like a typical hotdog, but the pancake and slaw were delicious and added to the uniqueness. I honestly enjoyed the conversations and observations I had in line more than eating. I don’t think I would wait an hour for this snack again, but I still enjoyed the experience. 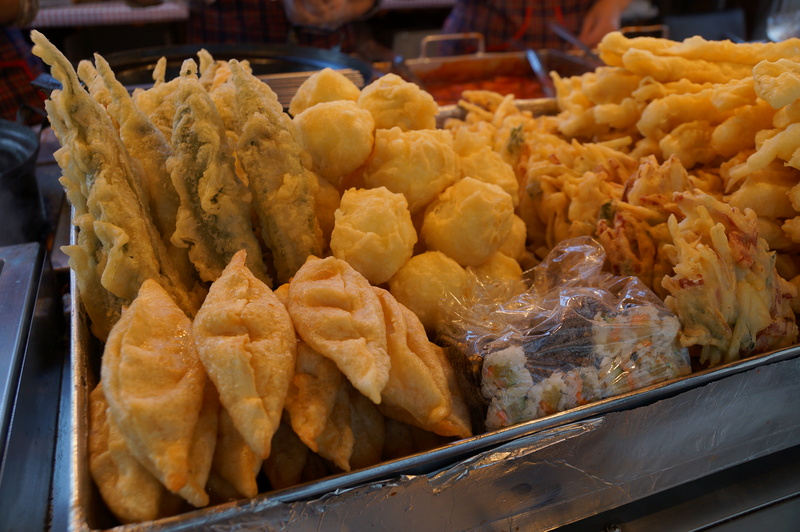 Noryangjin is the only place where I have ever seen Southeast Asian food on the street in Seoul. The booth is decorated with Vietnamese flags, so it stands out amidst the other stalls. The dishes I had here, were some of the best I tried, so I highly recommend it. This stall also has long lines, so be prepared to wait at least 15 minutes to get served. At this stall it seems that the Pho is the most popular choice. This makes sense, as the steamy hot broth and noodles are the perfect food to eat in Seoul’s cold winters. However, I must say it is a tricky food to eat on the go. Luckily the Mcdonalds on the other side of the sidewalk, offers a great curb which doubles as a bench to sit while wolfing down the meal. 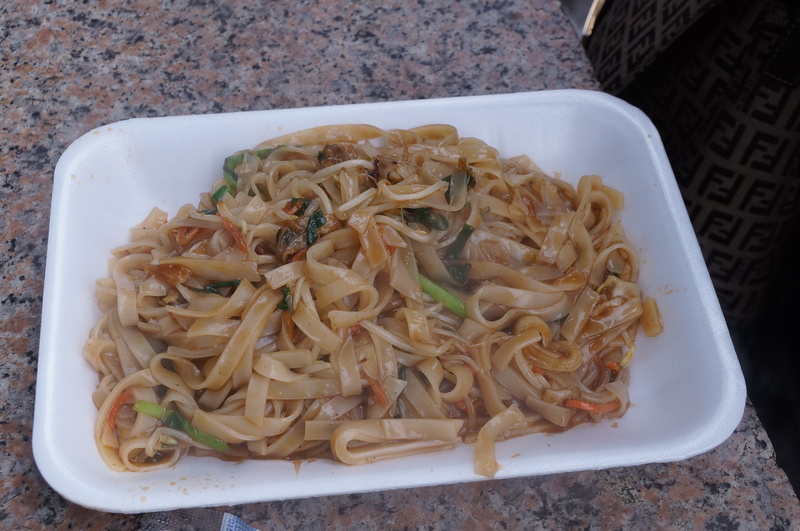 I was very impressed with the price and flavor of these noodles dishes. Each item was only 3,000won (3$) and we received a generous portion. 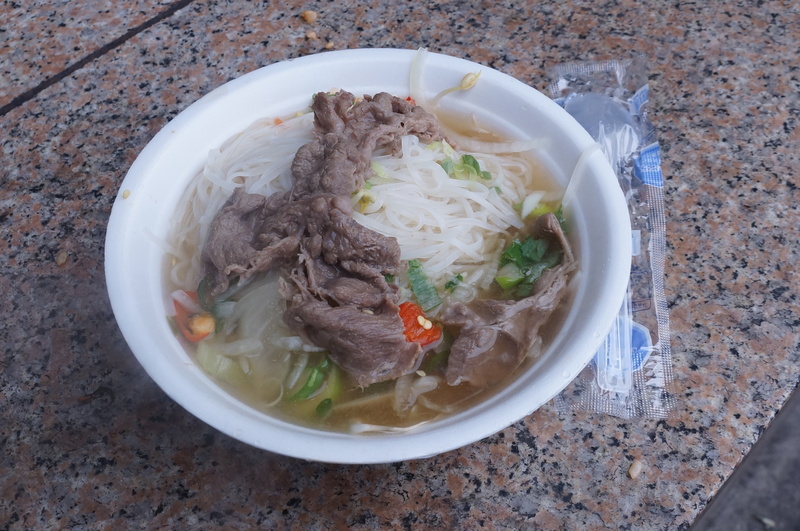 The broth of the pho was savory and rich in flavor. I even thought it had a better taste than many of the popular Vietnamese chains found in Seoul. Patrons also had the options to add chile sauce to make the dish spicier. I highly recommend this stall if you are looking for something other than Korean food. I am not quite sure what to call this next dish. This rice bowl is topped with kimchi, chili sauce, spam, bacon, a fried egg, spicy sausages, and some other unidentifiable meats. By the sound of it, it may not seem appetizing; however it was much better than I had preciously anticipated. The sausage is cooked in a spicy chili sauce, while the other meats and egg are fried up on the griddle. 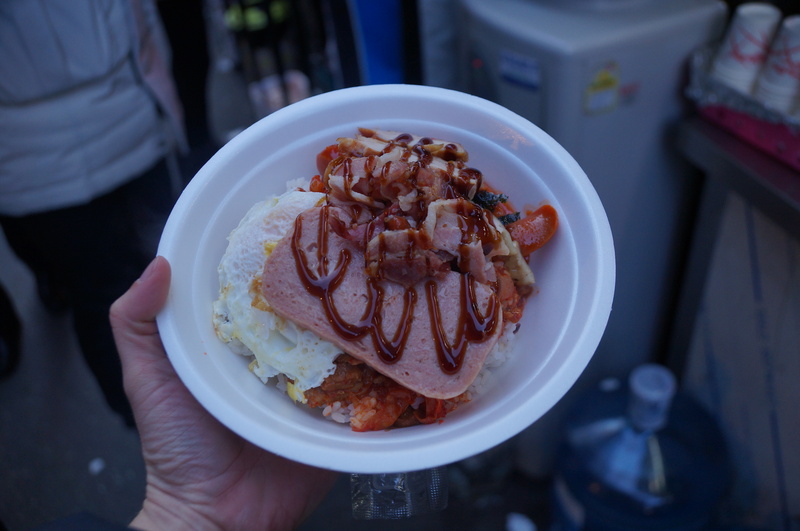 All of the meats are layered over the rice, then topped with kimchi, gochujang (chili paste), and a fried egg. I then took my spoon and mixed it all together, kind of like I would with Bibimbap. I took my first bite with hesitation, however I was pleasantly surprised. The SPAM worked well with this dish thanks to the spiciness of the kimchi and gochujang. The ingredients reminded me of Budae Jiggae (Army Stew) which is comprised of a variety of cheap meats and flavored with gochujang. Budae Jiggae was created during the Korean war when food was scarce. The Korean people would make use of the surplus foods from the U.S military bases around the Uijeongbu and Pyeongtaek area. 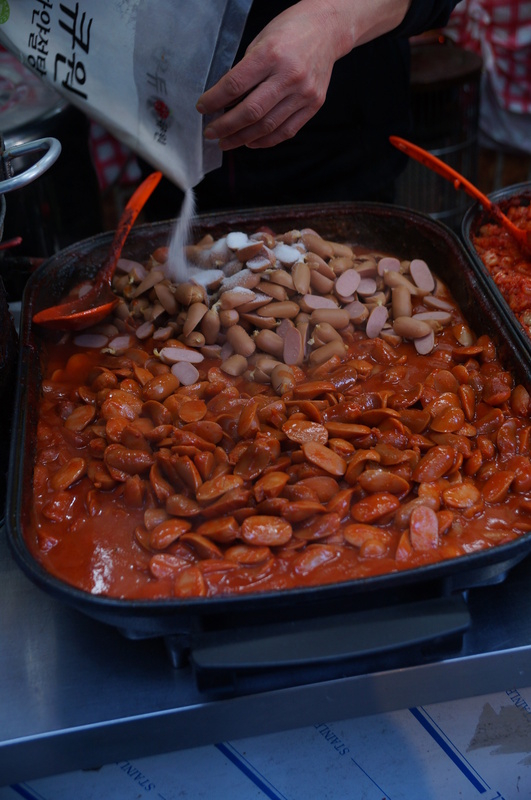 They took hotdogs, Spam, and Ham and flavored the stew with kimchi and gochujang. Modern versions of this dish add other ingredients such as instant noodles, cheese, ground beef, green onions, or tofu. This street food version of a “budae jiggae rice bowl” was quite delicious. If you are not vegetarian, I highly recommend giving it a try. This booth can be found on the side street between the Vietnamese cart and the pancake-hotdog stand. There are a few different carts selling rice bowls like this, and they all seem equally popular. 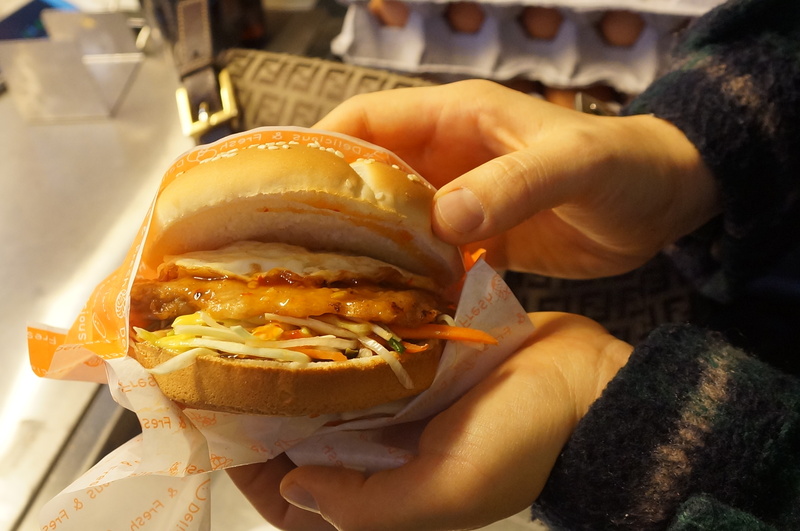 Another street food rarity, than can only be found in Noryangjin, are hamburgers! 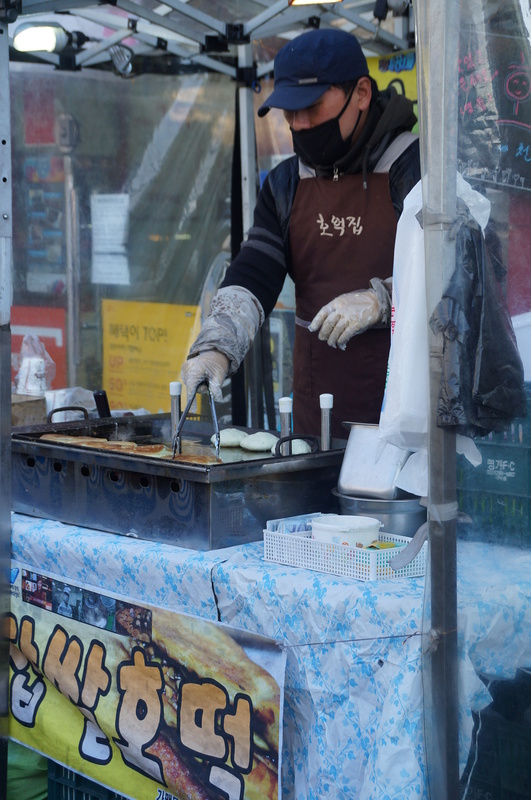 Hotdogs on the other hand are in abundance all over Korea, but it is rare to see a street vendor selling hamburgers. This booth is located almost directly across from a McDonalds, yet people are still willing to wait to get a freshly made burger street side. There are two varieties: cheese or no cheese. Then you can choose to get your patty dressed with mustard, ketchup, sweet chili sauce, or spicy chili sauce. Also all the burgers are topped with a fried egg and cole slaw. They also have the option of getting a single or double patty. I did not order the hot dogs, as the burgers seemed to be the more popular choice. Also I am sure that these hotdogs were no match to the pancake dog just down the street. This booth is busy, but not as crowded as the others, so you can get your meal rather quickly. 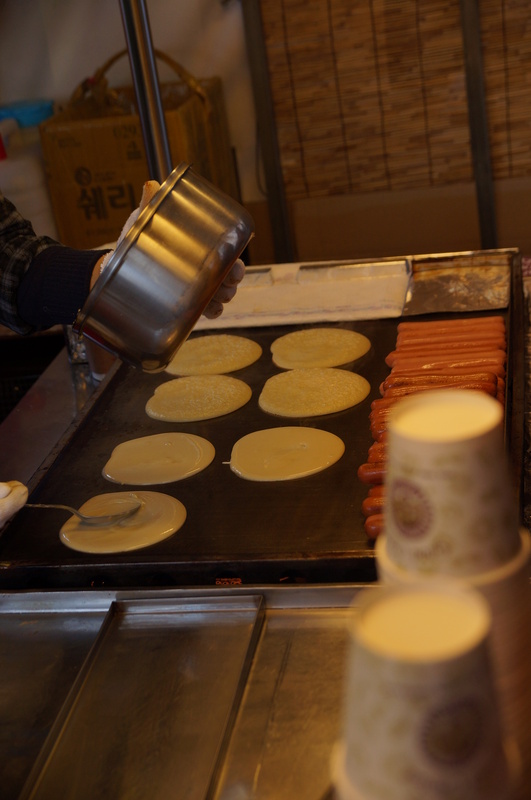 No street food area would be complete without these staple Korean items. 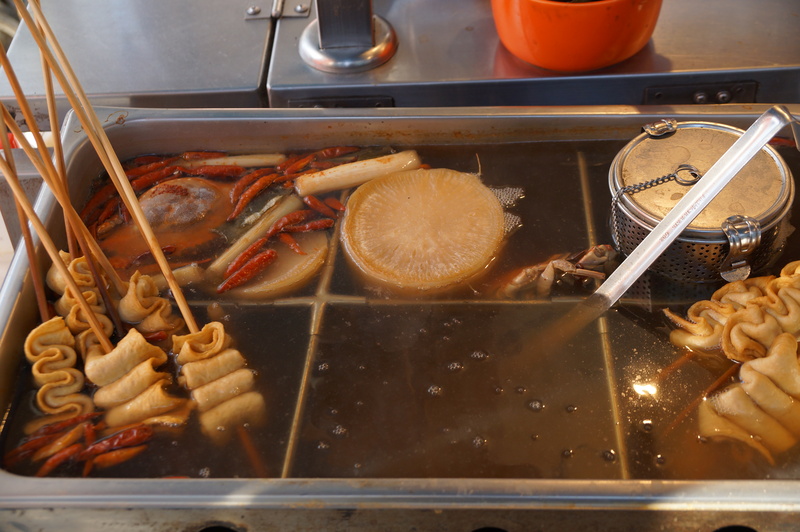 There are about 3 carts in Noryangjin that serve Tteokbokki, Soondae, and a variety of fried goodies. All the booths are equally as good, so just choose the one with the shortest line. For those reading that are not familiar to Korean food, let me introduce you to some of my preferred curbside treats! First I will start with my favorite, Tteokbokki! 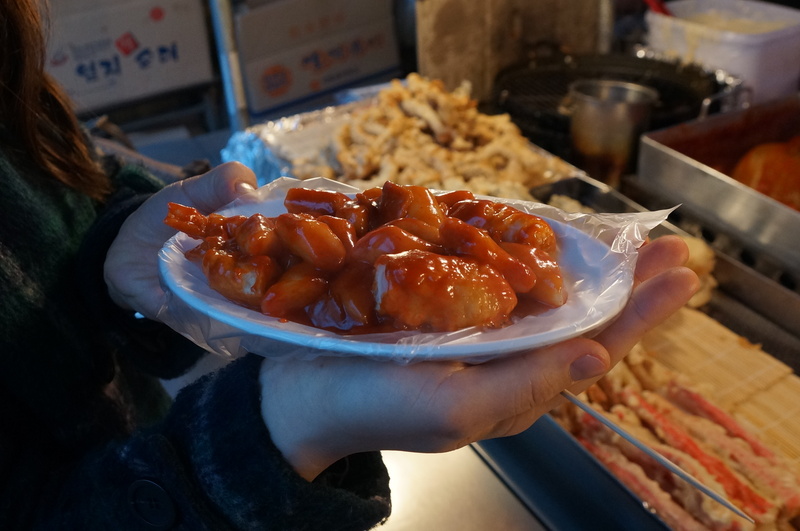 Tteokbokki is a snack food made from soft rice cake, fish cake, and red chili sauce. Sometimes the sauce can be fire hot, or it might have a sweet and spicy taste. It just depends on the vendor. Generally, the darker the sauce, the spicier it is. You can turn this snack into a hearty meal by adding ingredients from the fried food area. I suggest paring it with friend shrimp and mandu, but really any of the options would suffice. The next item is Soondae. 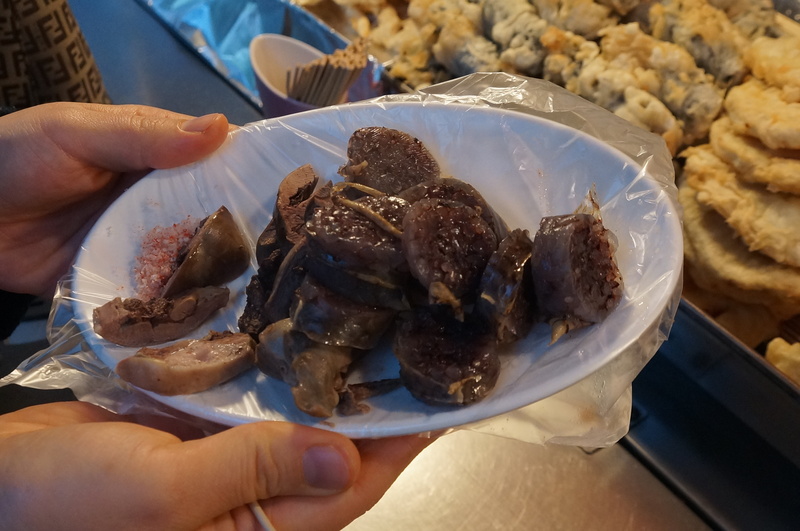 At first Soondae may seem like a scary dish to eat, because it is made from the intestines of a cow or pig, however it is just Korean’s version of a “blood sausage”. It is basically a lighter or toned down version of British blood pudding, Spanish morcilla, or French boudin noir. Soondae is made by mixing pork blood with cellophane noodles or glutinous rice. Then the mixture is stuffed into intestinal casing. The texture is slightly chewy, but it is eaten easily. The chewiness comes from the casing, while the insides are soft and have a somewhat gummy texture from the noodles. The taste is mild, however when paired with the Tteokbokki sauce or salt it is quite delicious. 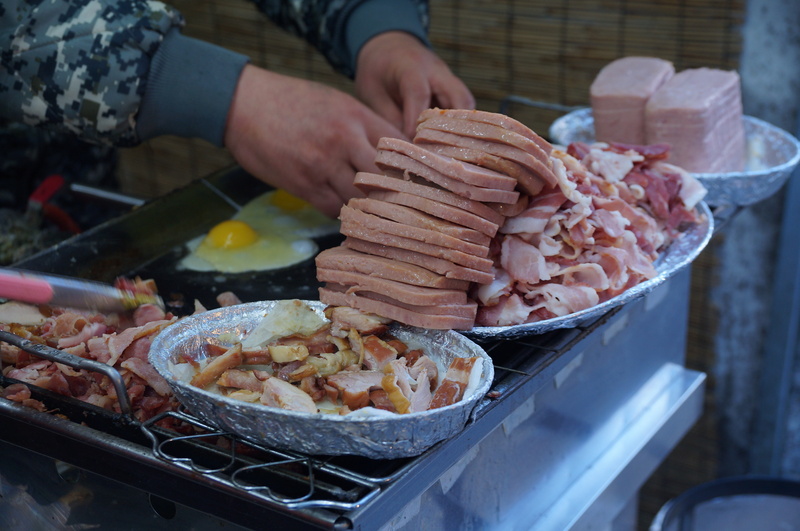 Soondae is a traditional food that was created out of the need to utilize the whole animal and waste nothing. It is so popular that there is even a whole street in Seoul designated for different Sundae variations. This area is located in Sillim-dong and it is very popular with Seoul National University students. Last but not least are all the fried goodies and Odeng. The most common fried sides are squid, mandu, potatoes, mixed vegetables, peppers, shrimp, and crab. The batter is similar to a tempura, so the it is not too heavy. The food is eaten with tooth picks or wrapped in a napkin. On the side of the cart, you can find soy sauce with a brush to add more flavor. However, I recommend pairing it with tteokbooki. Before I forget, the last item in this section is Odeng which is a skewered Korean Fish cake served in broth. Honestly, I am not the biggest fan of Odeng because it can be a little bit fishy tasting, but I will say that the broth is nice on a cold day. Also, I do like the way Odeng can add flavor to stews and soups; I just prefer to not eat it on its own. All of these itms can be found anywhere in Seoul, so you do not need to go to Noryangin to try these delicious delicacies. However, if you are in the area, I highly recommend any of the booths serving these amazing snacks. Let’s switch gears from all this savory food, and check out the sweets! First up is Hotteok which is a pancake that has a sweet filling. The dough is made from wheat flour, water, milk, sugar, and yeast. Handful sized balls of dough are then stuffed with a variety of sweet mixtures. These fillings may contain brown sugar, honey, chopped nuts, or cinnamon. Finally the dough is placed on a greased griddle and is pressed into a flat circle. The insides caramelize and stay chewy while the outside has a nice crispy golden crust. As you eat it, the insides ooze out, so be careful and let it cool a little before digging in. This delicious pancake is phenomenal, and must be tried if you have a sweet tooth! BingSu is not actually street food, but I had to add it to the blog, because it is just that good. Bingsu or Patbingsu is shaved ice that is mixed with condensed milk then topped with fresh fruit or sweet red bean paste. 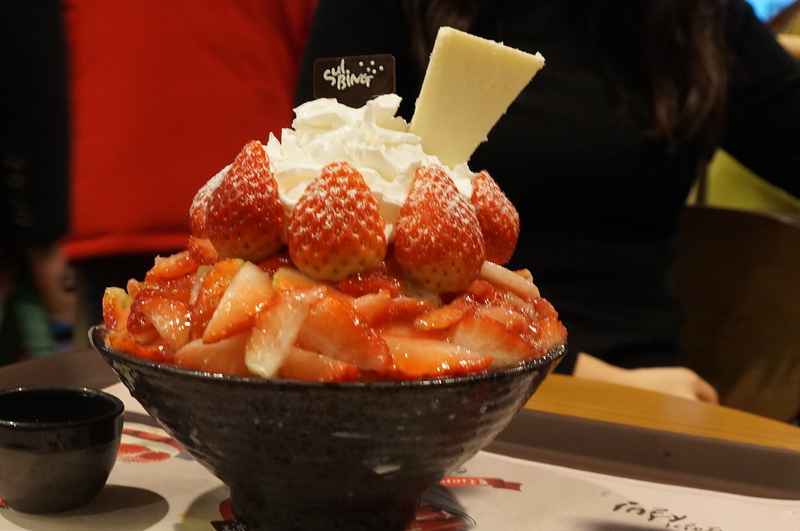 My favorite place to get Bingsu is a cafe called “Sul Bing” or Korean Dessert Cafe (English name), because they have other toppings than what is traditional. Some varieties include chocolate, ice cream, cheesecake, mixed fruits, or cookie toppings. Sul Bing is actually a popular chain, so you can find it anywhere, but this particular one is located right in the beginning of the street food area. To find it, go to the left of Exit 3, and look up to the second floor. 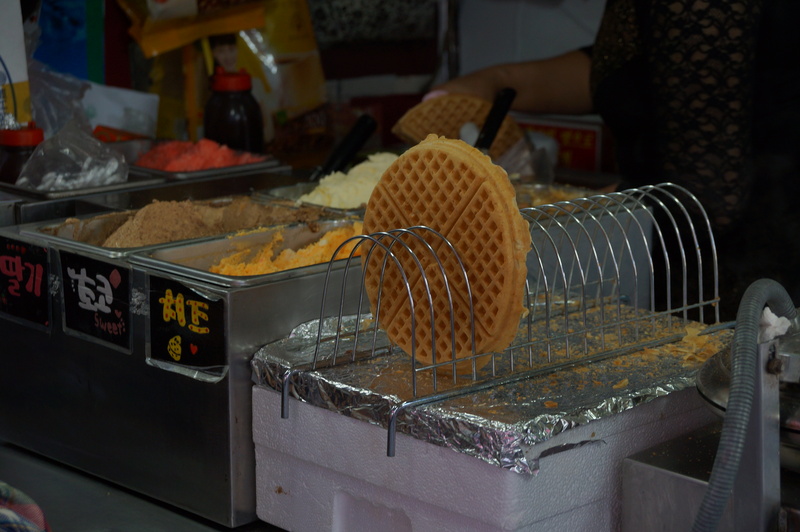 The other dessert offered on the street is a waffle with a sweet cream filling. The smell from this booth is quite pungent, so just follow your nose, and you will easily stumble across this booth. When I first inhaled the sweet aromas coming from this stand, I thought this would be the most heavenly treat imaginable. However, I hate to say, I was rather disappointed with I tried it. The waffle tasted a little stale, and the cream was way too sweet. I have quite a sweet tooth, but the sugary taste was just too overwhelming and rich for me. Maybe I was just there on a bad day, as the booth seems to have a continual crowd flocking to it, or maybe the smell is just deceptive and others are getting fooled just as I was. My recommendation is to stick to the Hotteok, or head inside to one of the cafes for a sweet treat. 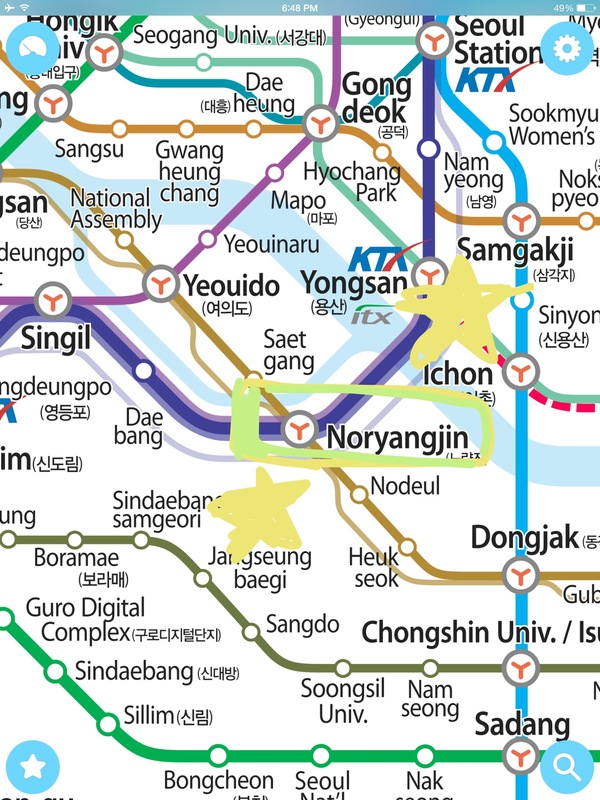 Noryangjin is located on lines 1 and 9. If you are taking line 1, use either exit 1 or 2. Next, walk over the road bridge, then take the stairs down on the left side. 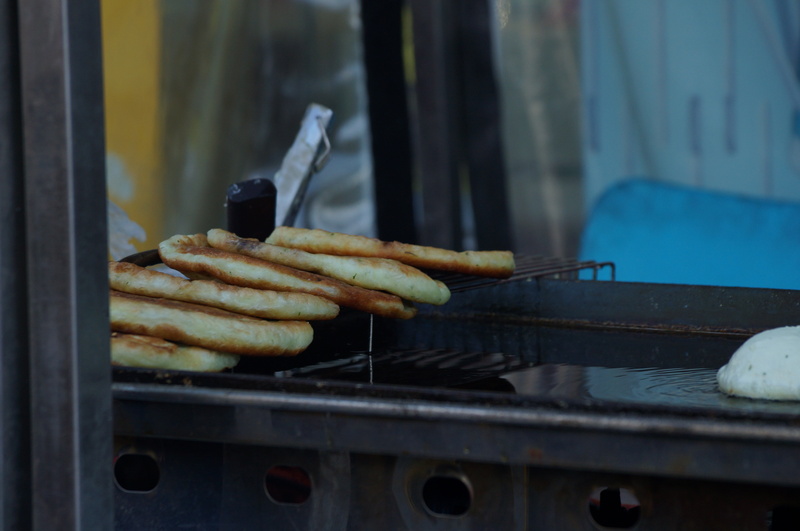 You will see and smell the food stalls as soon as you hit the sidewalk. If you are taking line nine, go out of exit 3. When you get to the top of the stairs, turn right, and the food stalls will be about a block down. I hope this blog was helpful to those looking to try to some delicious Korean food. If you have any questions or comments, please leave them below!